Today was our first full day at home in over twenty days. :) Wow. It was pretty much business as usual: Daniel went to work, Owen went to 'school', Nurse Ivey came over and we all just did our thing. That included lots of cuddles for Evelyn and me, groceries, laundry and getting more of these medical supplies organized. While we were in the hospital, spring came to Atlanta, so there is all kinds of stuff to be done! Evelyn's first post-hospital outing is going to be a quick trip to Home Depot tomorrow to choose some flowers for our front door planters, as well as vegetables for the garden. 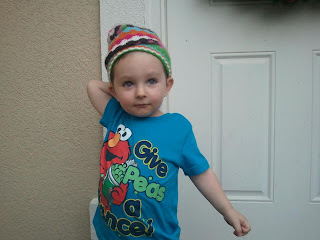 We are also planning some clothes shopping soon - once I take stock of what each kiddo has that fits from last year. This weekend we are planning some kind of family thing; not sure what yet, but we want to get outside and do something fun. Daniel and I are also planning to buy a van in the next week or so, make more (lowfat) Evelyn meals, and go on a date. All these plans - but if Evelyn and Owen are happy, healthy and settled, then its fine if nothing gets done. My goal is to focus on the task at hand (whatever it may be) and not get overwhelmed with the ginormous to-do list in my head. When we come home from a hospital stay I always feel so happy, relieved, thankful - and then I start to think about all the chores and 'life stuff' that I had blocked out during our stay - and I get really stressed about it all. Here's to hoping I can just live in the moment (and hopefully take a few naps!) these next couple of weeks. I think the title of this post (stolen from Owen's tshirt) is a pretty good message to me (us) - we need to give peace a chance. We should try and overlook all the mess (both literal and metaphorical) and try to just enjoy being a family. Treat the patient not the numbers. Big Progress! and little challenges. Yet another quiet day - for the most part.